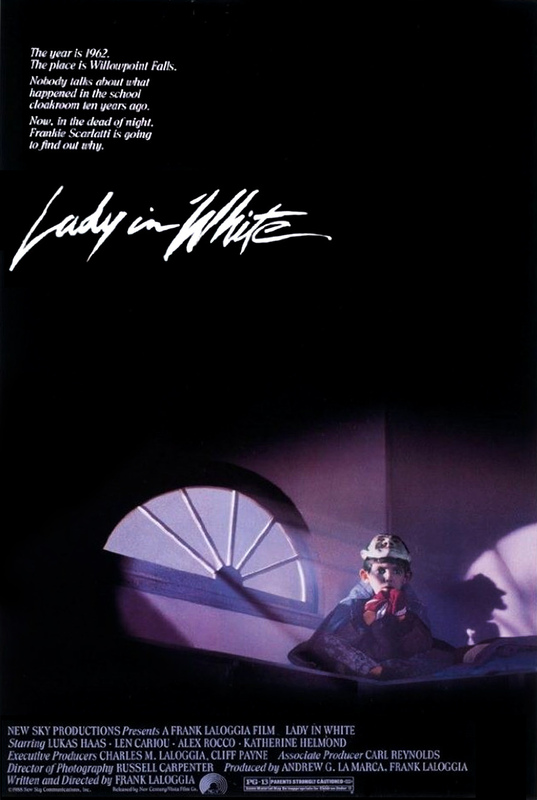 February 1, 2018 — At first, the 1988 film Lady in White seems like a delightfully nostalgic Halloween ghost story. However, if you set your kids in front of it and go off to the store to replenish your stash of mini candy bars, don’t be surprised if you come back and their fingers have sunk death grips into the white flesh of their popcorn balls and their candy apples are all fuzzy from having been dropped on the carpet in horror. You see, about half an hour in, the movie tightens the drama by turning into a mystery about a child murderer as well as featuring a heavy civil rights sub-plot. It also becomes a Christmas flick. It does keep the ghosts throughout, though. Written and directed by Frank LaLoggia, this film is based on his childhood in Rochester and on a Rochester-area legend of the pale ghost of a woman eternally looking for her daughter’s murderer. He even covertly cameos as the narrator of the film, who is a horror author. 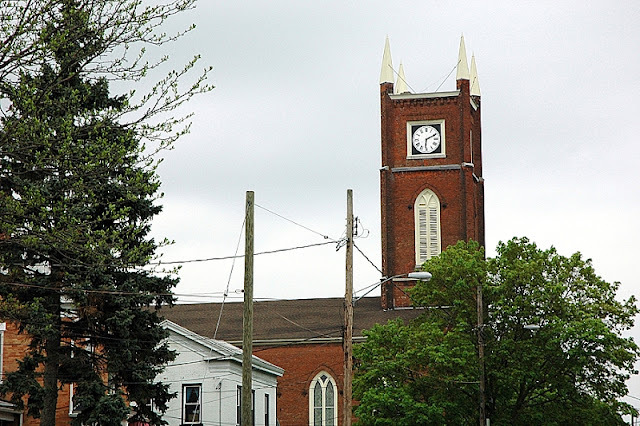 For the story, LaLoggia wanted a smaller-town feel than late 1980s Rochester, so he chose a few towns south and east of the city to collectively represent the fictional town of Willowpoint Falls, where the story takes place. The first real location in the movie Willowpoint Falls Cemetery. 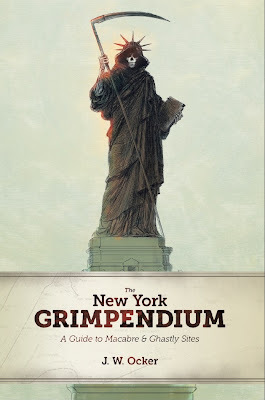 It is here, where the narrator (and protagonist-all-grown-up), gets nostalgic, jumpstarting a formative story from his childhood. 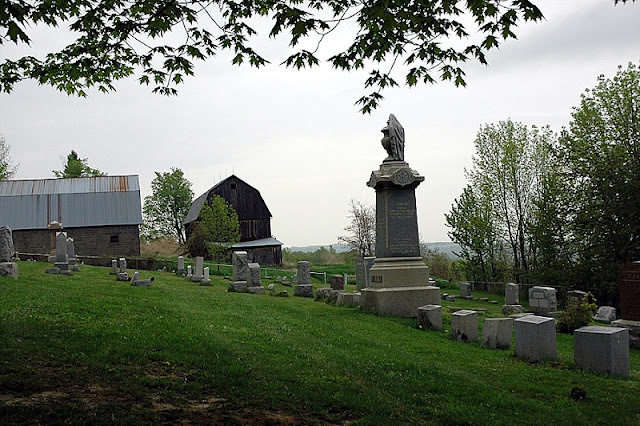 The cemetery in real-death is Coye Cemetery, located at the top of Bopple Hill at the intersection of Route 21 and Bopple Hill Road in the town of South Bristol. The tiny cemetery dates back to the 1800s, is adjacent to a couple of old farm buildings, and features a nice view of Canandaigua Lake. 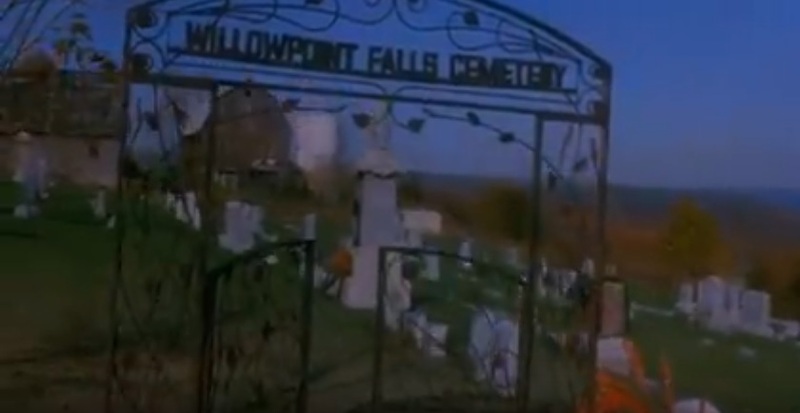 The entrance is on Route 21, but in the movie they installed a fake gate at the side of the cemetery, where there’s a slight pull-off. Sorry about the blurry screencaps in this post. Last-second grabs off YouTube. 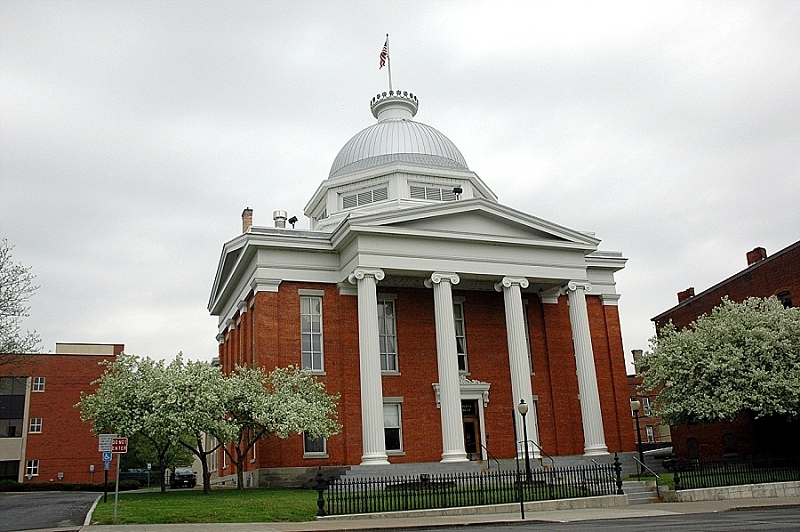 The town of Lyons stood in for the downtown Willowpoint Falls scenes, especially the area around the Wayne County Courthouse at 26 Church Street, with its silver dome and the Village Square Park that it faces. The four-pronged clock tower of the nearby United Methodist Church at 93 William Street was also used for town overview shots. 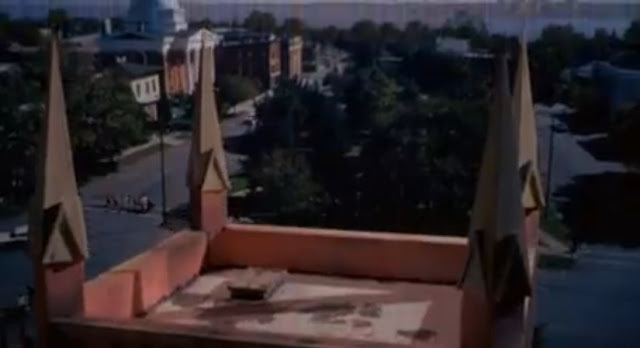 Obviously a model in this shot, but the church shows up here and there in the downtown scenes. Incidentally, Lyons is also the location for all the exteriors for another 1988 horror film, Slugs. You can probably guess from the five letters of its title, but Slugs was about a slimy infestation of black carnivorous slugs that somehow manage to be as lethal as a park full of cloned dinosaurs. 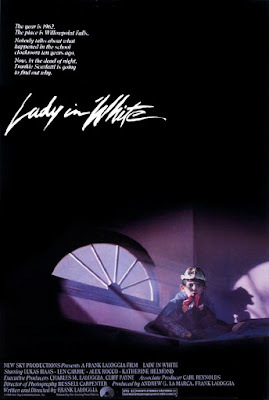 Back to Lady in White, the inciting incident of the film occurs when the main character, a young boy, gets locked overnight in the school cloakroom on Halloween. There, he watches the ghost of a little girl pantomime her murder from a decade before, after which the boy is then attacked by the real-life murderer. 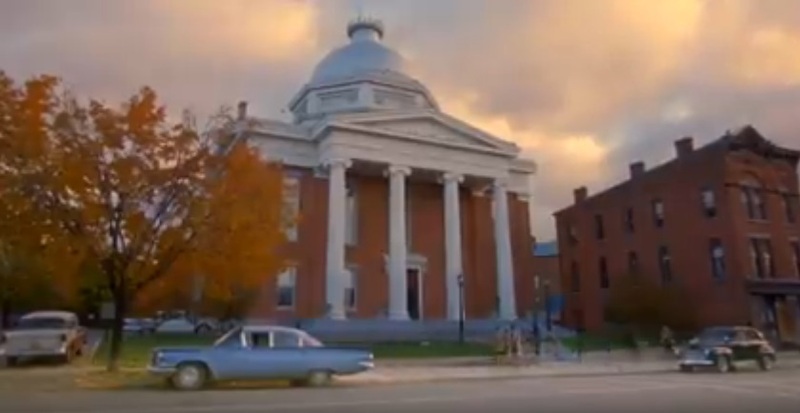 When it was filmed, the building was actually Midlakes Middle School in the town of Phelps, at 144 Main Street, right beside Resthaven Cemetery, an aspect that the film makers take advantage of for a few of the scenes. 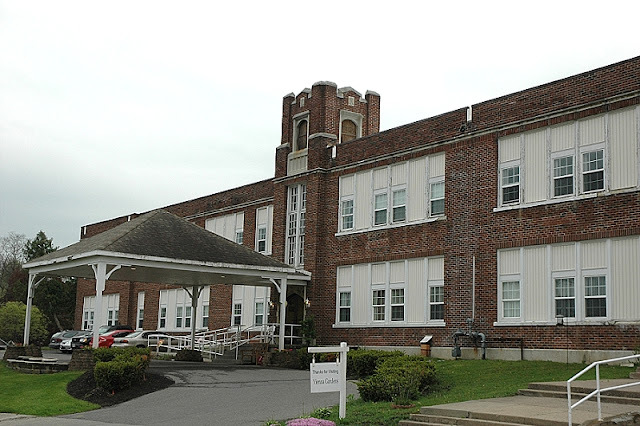 These days, the school has been turned into a retirement home called Vienna Gardens. 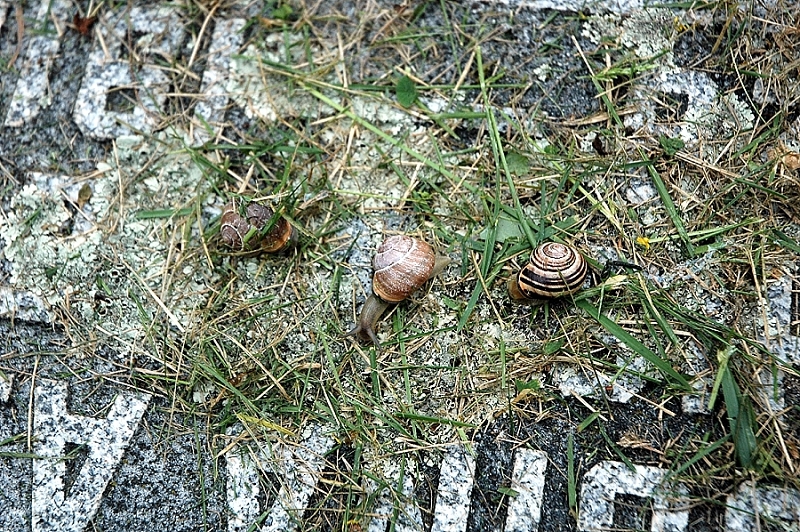 The cemetery is still there. 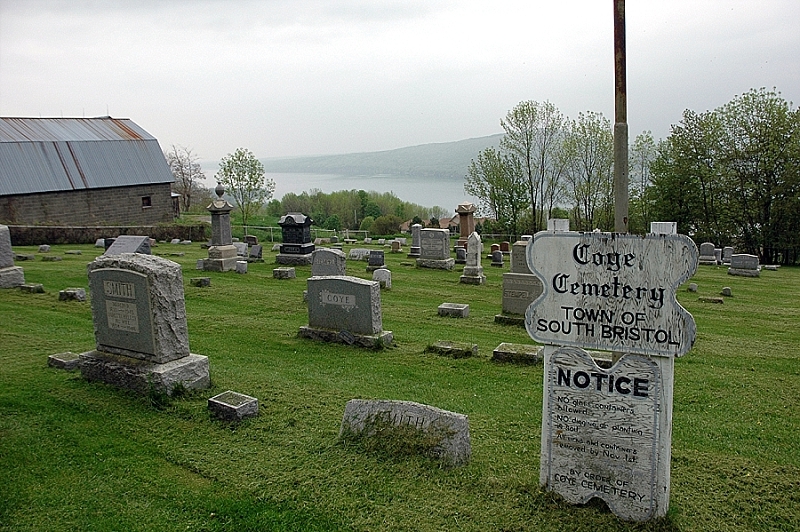 The dead are notoriously sessile. 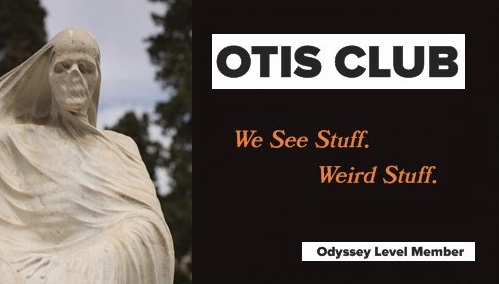 In the movie, a small, semi-circle window in the cloakroom overlooks the cemetery and was used for the movie poster, the video cover, the DVD cover, and, these days, the jpeg on a Netflix screen. You can kind of tell from the way they filmed it, but the window was a mere cinematic embellishment. Although some of the windows in the building do overlook the cemetery, they are large and rectangular. 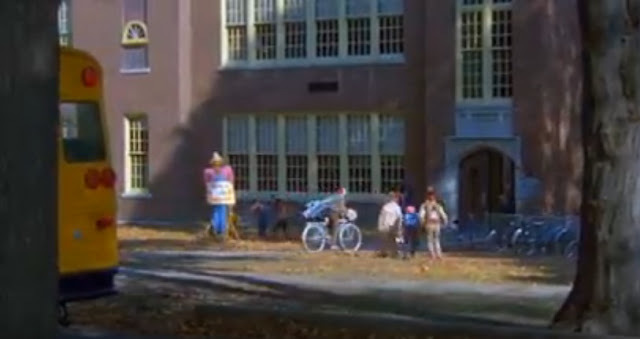 Other than a few houses featured here and there in the area, the only other major locale is the cliffs in the movie’s climax. In movies, every town no matter where it’s situated has amazing cliffs from which to drop its villains. In real life, there are only a few good locations for that. In this case, they had to borrow Hawaii for those scenes. So if you’re in the mood for a Halloween movie with lots of great childhood scenes to watch with your kids, plus a few that make you wonder if you really should be watching this with your kids, there really is only one movie for you. And it’s not Slugs.